How to Create a Family Chore Chart - Simple steps to getting chores done. What chore am I on this week? I have heard that question from our kids many times before! Do you wonder how to create a chore chart for your family that will actually work? Have no fear. I will share with you what we have done that has worked well for our family over the years. It may be just the inspiration or help you need to create what will work for your family. I also have a treat for you at the end of this post, so stay tuned! Helpful Hint: The best chore chart or chore schedule for your family is the one you use consistently. If you don’t use it consistently, it will not work, because the chores will not get done. It does not matter how simple or detailed your chore chart is; as long as it works for your family and it is followed, it is the best one to use. 1. Decide what chores need to be done. What chores need to be done? Make a list of the tasks that need to be done around your home. Our list includes laundry, cooking, vacuuming, picking up toys, sweeping, and more. 2. Decide how often each chore needs to be done. How often do these chores need to be done? Twice a day? Daily? Weekly? Monthly? 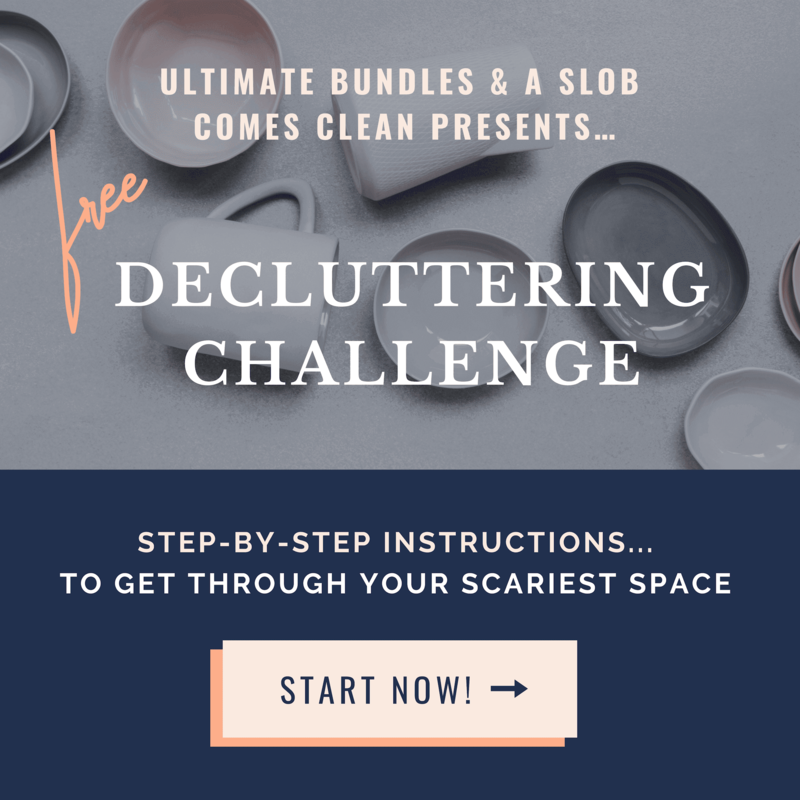 Look at each chore on your list and write down how often it will be done. Laundry is something we usually do every day. Vacuuming is something we do once a week unless there is a circumstance (cracker crumbs on the carpet when we told the kids not to eat over the carpet!) requiring someone (the cracker eater himself) to vacuum during the week. 3. Decide who can do what. We did not assign chores to our kids to do by themselves until they were about seven years old. 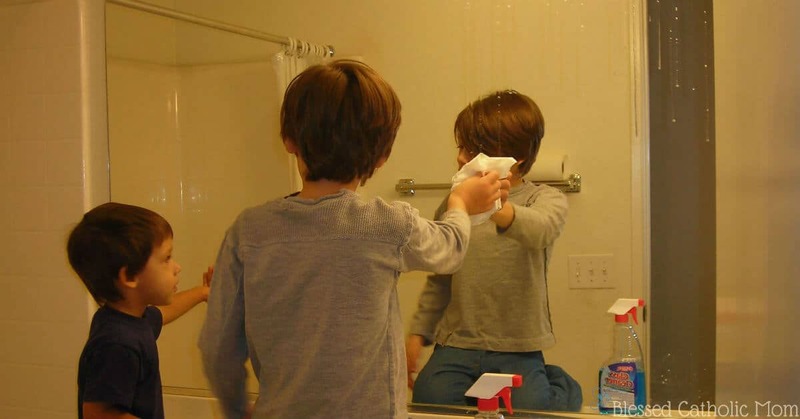 They did pick up their toys, put their laundry away, and other tasks, but before the age of seven, we assigned them on the chore chart as a helper for an older sibling or a parent. This way, they learned how to do things and would help even if they were not old enough to handle a chore by themselves. This for me is the fun part. I made a chore chart to reflect what needed to be done and who would do it. We have it posted it in our kitchen by our wall calendar so everyone can see it and know what their responsibilities are each month. Our chart rotates tasks each month, so over the course of five weeks (since we have five kids) each child will have the opportunity to do all of the chores listed on the chart. We originally rotated chores on a weekly basis, but our kids said that one week was too short; they were just getting into the habit of one chore routine and then they had to switch to another. We discussed together what would work best, and we changed the chore rotation to be on a monthly basis. This is working very well for us. Here is how we break down the chores to be done around our house. Besides taking care of their own bedrooms, our kids are each responsible for one room in the house, one chore, and one after dinner chore. Each child is responsible for their own bedroom. They are expected to keep their rooms relatively neat and the floors clear. They share rooms, so they divide up the cleaning: one will vacuum for a month and the other will dust for a month, then they will trade. Picking up toys, clothes, etc. is a daily task. Vacuuming and dusting bedrooms is a weekly chore. We divided the common areas of our house into five sections: family room, living room/school room, kitchen, entryway/front porch, and bathroom/hallway. Each day these rooms need to be picked up. This means laundry, stray toys, shoes, or other projects need to be put away by the end of the day. Once a week the room needs to be vacuumed and dusted. 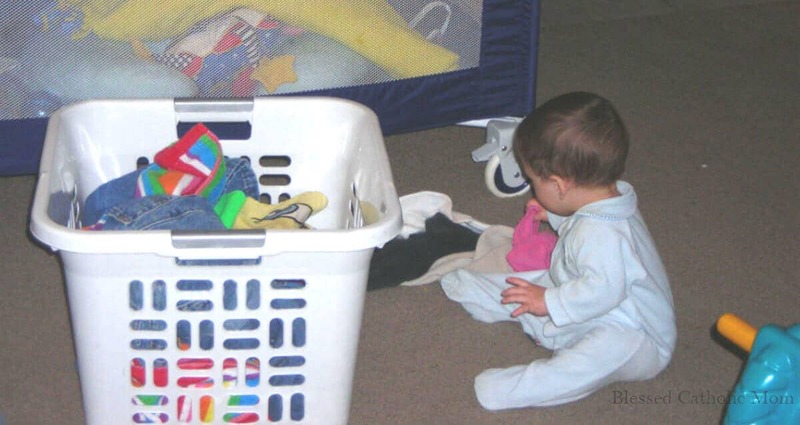 Toddler boy helping to unload the laundry from the basket onto the floor! The chores we decided on are: cooking, dishes, laundry, taking out the trash, and giving our dog food and water. Each day these chores are done or checked before lunch, before dinner, and before our kids can use any media. Our after dinner chores are: putting away food and condiments that are on the table and wiping off the table, cleaning the stove top and counters, sweeping the kitchen area, sweeping the dining area, and washing dinner dishes, pots and pans. We each wash own our dishes and silverware, so the person on dishes only needs to wash the items (measuring utensils, bowls, serving dishes, pots, pans, etc.) related to the meal. My husband and I work with our kids. Some chores, like feeding our dog or taking out the trash, are easy ones to do and our kids do them by themselves. Other items that are more time consuming or are easier to do with someone’s help, we do together. 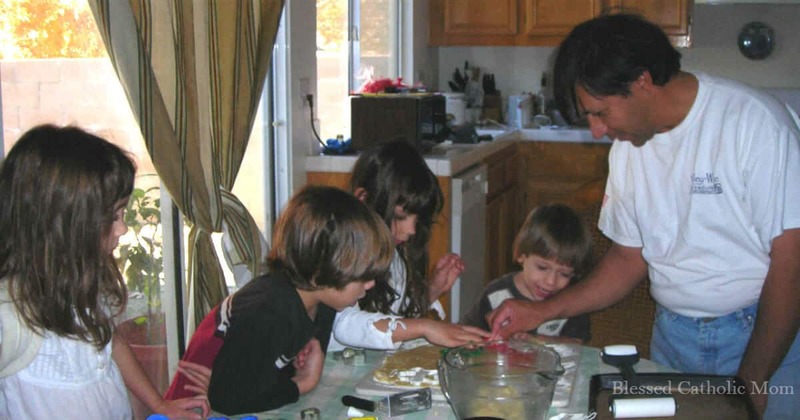 We cook and wash dishes with our kids and handle the laundry together. We decided to set up our chore chart and give our kids chores for a few different reasons. Our kids are old enough to help around the house. We want them to be responsible for their things (put them away rather than leave them all over the house or outside) and learn to take care of them. It is also important to my husband and I for our kids to know how to cook, clean, and do laundry. We want them to have these skills because one day they have their own homes to care for. We all contribute to the clutter, mess, dirty clothes, and dishes as a family, so we should all participate as a family to clean and care for our home. Another handy hint: Do not expect perfection! To be totally honest, I am still working on this one! As our kids learn how to do chores, I need to remember to not expect perfection. They are learning, after all. They did not wake up one day knowing how I want them to vacuum, or the best way to clean the floor or load the washing machine. When our kids are little, they are happy with their efforts and proud to show us what they did. When we criticize or want to refold something so it is the way we want it, this is discouraging to them. I would much rather have them working beside me willingly than cringe when they see me out of fear of my criticism. If I need to address something they can do better, I can show them how to do it or explain kindly and patiently how to do it. Here it is! The treat I mentioned at the beginning of the post is a blank chore chart you can use for your family. 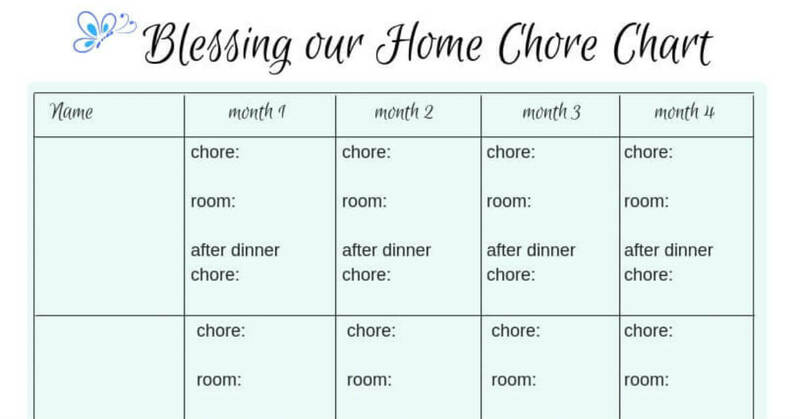 It is based on the chore chart we use in our home. I hope that you find it helpful to use as it is or to inspire you to make one that will work best for your family. 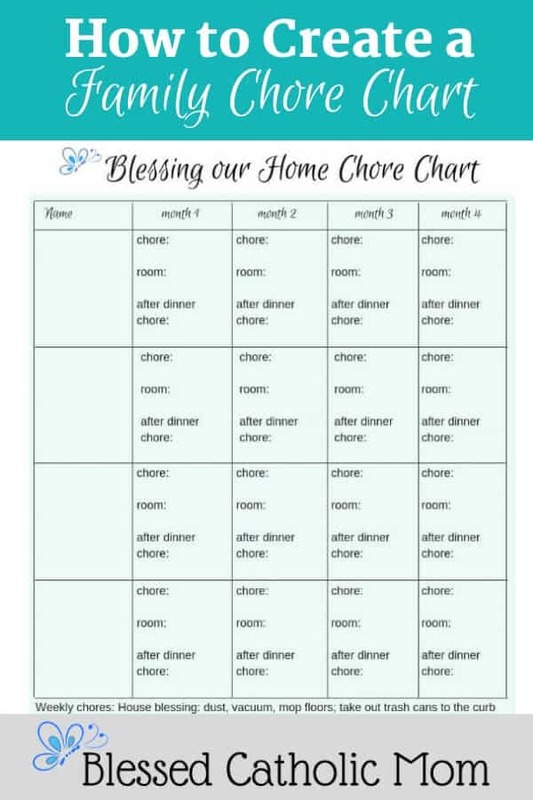 I have titled the chart Blessing our Home Chore Chart because we bless our home when we keep it neat and clean. In doing so, we also show God that we appreciate the blessings He has given to us. How do you work out doing chores in your home? Comment below if you’d like to share. We can help each other out and learn from each other! After 20 years, they can still tell you which night was their night on the couch! Thank you for sharing. That is a great idea! You killed two birds with one stone. It is helpful to have associations like that; it makes it easier for everyone to remember.